We are a small farm in Kitsap County, WA that offers dressage, eventing and jumping riding lessons, horse training, and sport horse sales. We also selectively breed, hand raise and train a small number of our own top quality warmblood foals. By keeping our breeding program small, we assure that each foal gets a lot of attention and handling, right from the beginning. Discovering and enjoying the unique personalities of each of our foals or sale horses is always a large part of our lives, so we can help make that 'perfect match' when the time comes. We strive to develop both confident horses and riders through our program. 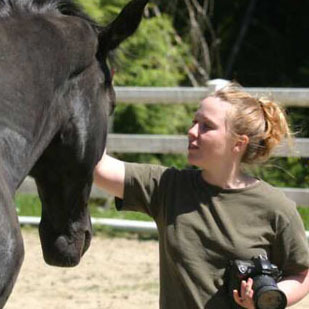 Anne is a Graphic Designer, Web Designer & Photographer with a habit of also picking up a side career in horses wherever she goes. She has been riding for 35+ years and teaching for 27+ years, focusing in Eventing and Dressage. She has also shown in Hunter/Jumper, Western Pleasure, Reining, Saddleseat and Vaulting. She was introduced to the world of sporthorse breeding while training the many quality horses and ponies of Elderberry Stables. Soon after, Blacktree Farm was created, standing the German Warmblood stalliion, Yeager GF. 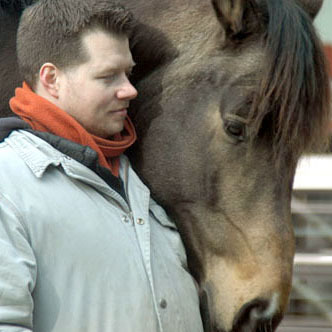 Sjon (pronounced 'Shawn') is a Film Maker, Digital Animator & Painter that also rides horses, but we suspect that his main interest in this whole operation is in having an excuse to play with tractors and chainsaws. He likes to jump and gallop on trails.